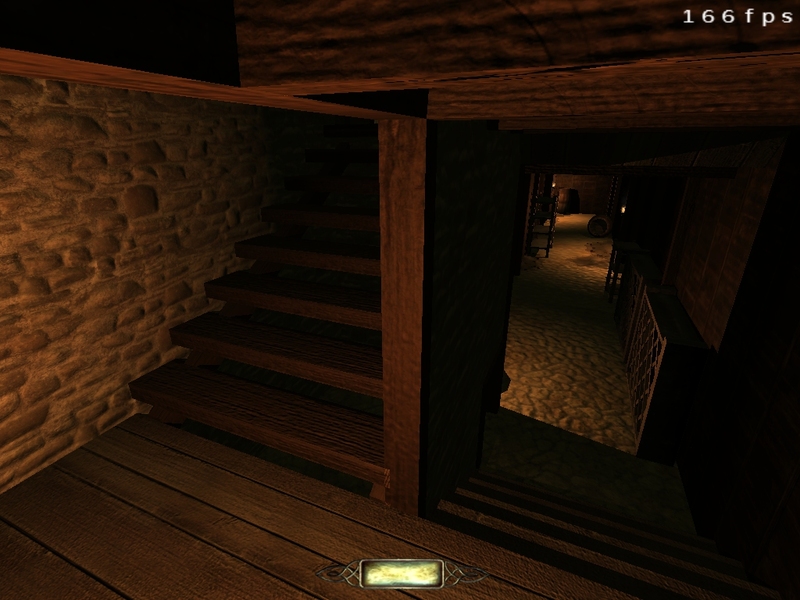 Briarwood Manor Issue - What's causing this? Could anyone tell me what is causing this problem? there is caulk on the back of the stairs - light shines through this. change the caulk to some other texture, the one already on the stairs would be the logical choice. select all the parts of the stairs and select make FS. select the new FS and clone that, then select make WS(world_spawn) and then change the texture to nodraw_wood. as there's a big stripe down that wall. Also nothing shows in the editor. 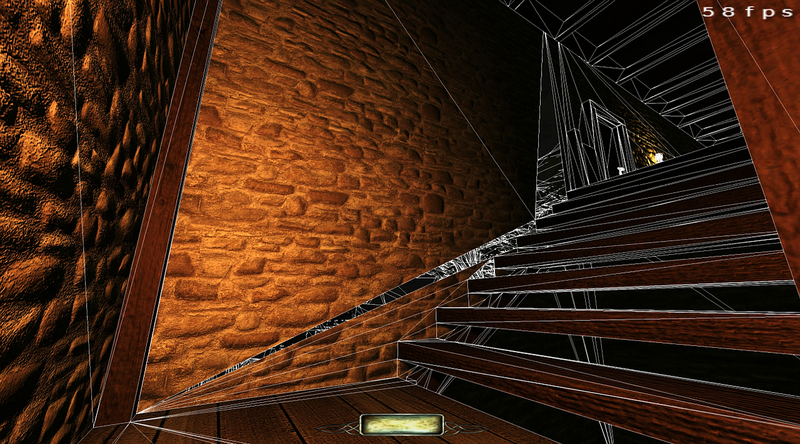 I had that on some stairs that were func_static, the only solution I found was to turn the stairs into an .ase model. I had it on six stairs that were used in an outdoor area, all the stairs were the same copied func_static but the holes in the stairs were in different positions, so one func_static became one ase model, and the holes went away. it looks like something is reversing the draw circle of the triangle, eg triangles drawn clockwise are visible while triangles drawn anti-clockwise/counter-clockwise are invisible. So the engine just isn't drawing those triangles that appear as holes. 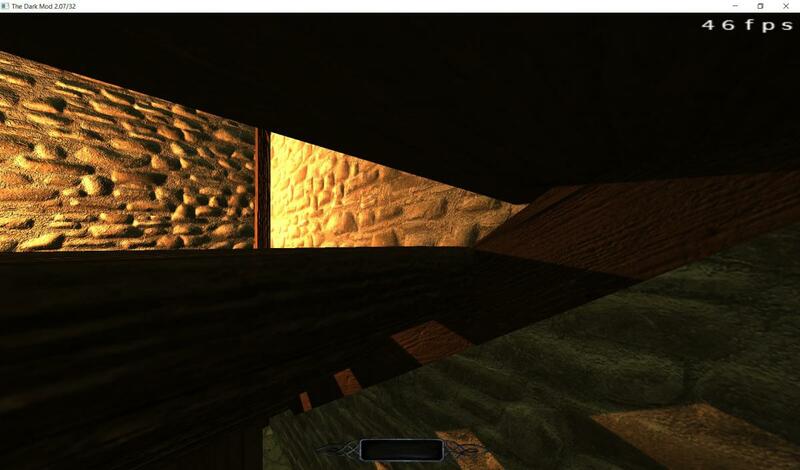 there's obvously nothing wrong in the way triangles are drawn in darkradiant, because the holes don't appear, and there's nothing wrong with the way the darkmod engine handles ase models as the holes don't appear in them, so the problem is probably in dmap when dmap does its T-junction join as the holes always seem to appear at that type of junction. Edited by stumpy, 11 August 2018 - 04:26 AM. Try stumpys idea, other wise I am happy to have a look at it for you. Is this a new problem or was it happening when the map was first released? Ive been seeing this type of thing a lot more since 2.06, the fix has in most cases is to convert to FS or model. If this was NOT present when the map was first released, but is appearing now, then it is an entirely new and more serious problem. If it was present when first released, then it is clear evidence the problem existed before 2.06. This is definitely something that popped up in 2.06. I've had the same problem, particularly with stairs or complex brush work. The only thing I could do was completely rebuild the stairs or brushwork. Ill look around my maps and see if I can find a solid example of this- I am using the hotfix build (2.07) and I am not seeing these problems so it may have been resolved. It wasn't a problem in version 1.6, it only showed up in 1.65 which was in TDM 2.06. Cambridge spotted it, and let me know, and since then I've been trying to fix it. How do I convert a func_static to an ase model? Did you dmap 1.65 using the 2.06 build? Edited by kingsal, 11 August 2018 - 12:22 PM. So just to be clear, you had that staircase in the version you released in 2.05 and it was fine, and you haven't touched anything about it since and now it has gaps in 2.06? So ensuring all faces to be quads would prevent triggering the missing tris bug? a great black triangular stripe across that wall, so you can't really miss it. It was never there before. It was brought to my attention by Cambridge Spy. I'm guessing given your responses, this might be a bug with 2.06 dmap. I'd be interested if any of you have dmapped your maps since 2.06 and seen this issue. yet the AI and I can walk up the invisible nodraw_wood worldspawn version of it. lol Puzzled why it isn't showing. Edited by NeonsStyle, 11 August 2018 - 11:46 PM. Drop me a PM if need another set of eyes on it. Edited by Bikerdude, 12 August 2018 - 03:36 PM. The lowest left step is z-fighting with the wooden beam. Can't repeat with svn code and current Manor map on the web. Yes I had a problem with transparent triangles occouring on 2.06 dmap, while same place was fine inne previous version. Edited by NeonsStyle, 13 August 2018 - 10:53 PM. If the stairs and the wall were BSP, and stairs were touching the wall, errors probably were there due to geometry splits. You should investigate such problems with wireframe turned on. Yup, it's a brushwork problem. It's neither very weird, nor version related. You will get these problems with BSP. Touching or intersecting brushwork will cause splits. That's why it's better to keep BSP as simple as possible, using models for everything else. what does BSP stand for..?